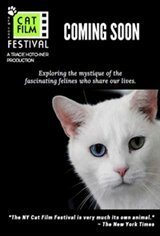 The NY Cat Film Festival is an exploration through film of the fascinating felines who share our lives, creating a shared audience experience that inspires, educates and entertains. For far too long, felines have been the "invisible"part of the human-animal bond and it's time to shine the spotlight on these magnificent creatures and the humans devoted to them. The annual NY Cat Film Festival will enhance our appreciation and understanding of who cats share our world, while benefiting local animal welfare groups and saluting those who work and volunteer on their behalf.